In anticipation of moving very soon I’ve been trying to go through different parts of my home and get rid of everything I don’t need. I am a hoarder. No, not the kind that you see on one of those reality shows that can’t walk through their home because of the vast accumulation of things, but the more subtle kind that saves articles, refuses to donate clothes she hasn’t worn in years, and somehow has collected seven blank, decorative notebooks over the years (in my defense all those blank notebooks were gifts). It is really time that I move without taking things with me that I will never look at or use again. So this week I went through all the esthetics related materials that I had at home and discovered articles that I had saved from years ago. I looked things over, I evaluated if I really needed to save the information, and some of the articles I actually found online so I pinned them onto my skincare board on Pinterest. Though Pinterest has indeed revolutionized the way I save information for future reference (and no I don’t think using the word revolutionized is too dramatic) not all the esthetics related material I read online can be pinned. So sad. So I still have a binder with articles, but at least the binder is now very organized. 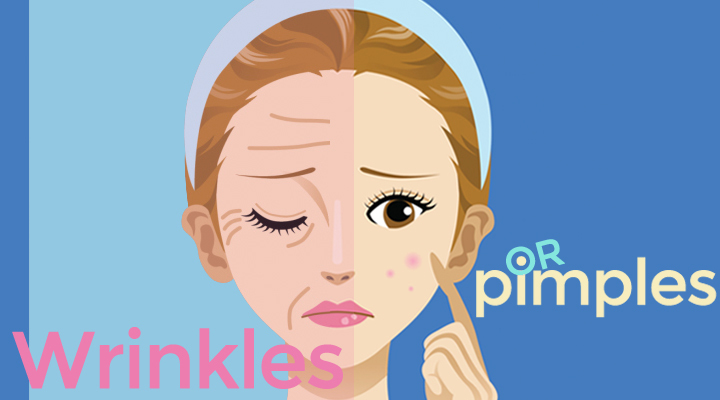 … all wrinkles are caused by the same chain of events within the skin. Age causes uppermost epidermal cells to get thinner and less sticky, which allows moisture to seep out in turn making skin drier. Oil glands begin to slow down, which contributes to dryness as well. A bit deeper in the skin, supportive scaffolding (i.e. collagen and elastin) breaks down, and skin loses its smoothness and tautness – leaving it no other choice than to wrinkle and sag. In the skin’s lowest layer, the subcutaneous layer, fat cells begin to shrink, so they are less able to “fill in” or plump out damage in the skin’s other layers. Sun exposure: The damage caused by UV rays does a number on our skin’s supportive matrix, mainly collagen and elastin. Think about it … wrinkles appear on the face, neck, chest, backs of the hands and forearms – all places that are most frequently exposed to the sun. Facial expressions: You know what happens when you fold a piece of paper too many times? A line becomes etched and it’s impossible to smooth out. That’s exactly what happens in areas of the face that are responsible for facial expressions. This is why the areas around the eyes and lips and on the forehead are often the first to show wrinkles. Skin color: Pigment plays a protective role, so those with lighter skin have less natural defense against damaging UV light. Conversely, darker skins usually show wrinkling much later in life, and they have their melanin to thank for that. Genetics: As with many other beauty and health concerns, your DNA dictates how wrinkly your skin will get. If your mom looked great well into her 60s, it’s possible you will, too, as long as you’re not baking in the sun every chance you get. Now what is the best way to prevent wrinkles and/or treat them? Dr. Baumann recommends the daily use of sunscreen to prevent wrinkles and retinoids if you already have wrinkles. To those recommendations I would recommend following anti-inflammation diet and incorporating antioxidant serum, such as a Vitamin C serum, into your daily skincare routine. One more thing – another thing about looking through things you’ve saved is discovering that you have already used the above mentioned article in a post. I briefly toyed with the idea of just updating the old post (it is almost three years old), but in the spirit of “out with the old, in with the new” I wrote this new post instead. Is Your Pillow, Pillowcase, or Sleeping Position Giving You Wrinkles? When Should You Begin Using Anti-Aging Treatments/Products? If we don’t already have enough to worry about when it comes to skin aging it turns out that perhaps how we sleep or on what we rest our head can hurt our skin. As with most skincare subjects this topic is highly debatable so let us check things out more closely. … we’re pulling apart the thinking that the way you sleep can exacerbate wrinkles. New York dermatologist Debra Jaliman, author of “Skin Rules,” breaks it down for us. “It’s best to sleep on your back, although most people find this difficult,” says Jaliman. Indeed. Every attempt I’ve made to become a back-sleeper usually ends back at square one, i.e., comfortably on my right side. “One way to do this is to put a U-shaped bucky pillow around your neck and to prop yourself with other pillows all around you so you don’t turn in your sleep,” advises Jaliman. Do you have fine lines, wrinkles, or crow’s-feet? Well, maybe it’s because you’re not sleeping on a pillow shaped like Transformers. At least according to the plastic surgeon who designed the JuveRest, a pillow that supposedly reduces the wrinkles acquired by smooshing our faces into our pillows while we snooze. “My patients are often surprised to learn there are two types of wrinkles on their faces: those caused by expression and those caused by facial distortion from pillow contact during sleep,” says Goesel Anson, the inventor of the pillow. Side and stomach sleepers are the most vulnerable since they spend a third of their lives pressing their delicate visages into heretofore thought totally innocuous bags of goose down. The Sleep Wrinkle Pillow’s totally un-pillowlike shape minimizes contact between the fabric and your face, thus reducing wrinkles … . Long time readers of the Beauty Brains may recall the debate that raged over our post on “Are silk pillowcases good for your skin.” At the time, we took the position that there is no data showing that contact between your face and the pillow case causes wrinkles. A new study published in the June 2013 of Dermatologic Surgery seems to support our position. Overall, more wrinkles were seen on the left side of the face (not related to sleep position) but instead attributed to to sun exposure while driving. Other studies have found more skin cancer on the left side of the face for the same reason. The study also calls into question if anti-wrinkle sleep pillows are worthwhile. Stephanie says: Is it true that it is better for your skin to sleep on silk pillow cases ? While your skin does perspire and while certain chemicals can clog your pores and cause acne, skin does not really “breathe” so silk doesn’t really make a difference in this regard. 2. Because moisture levels are being maintained throughout the night, deeper lines and wrinkles are not forming. Moisture loss causes dry scaly skin, not wrinkles. A pillow case can not stop wrinkles from forming. 3. Different from run of the mill silk pillow case as it is made from organic silk which contains amino acids, the building blocks of your skin. ALL silk is made of amino acids, so the fact that this silk is organic is completely irrelevant. And the amino acid profile of silk is different than keratin protein, which is what skin is made of. And, even if it were the same, it’s not like the amino acids leap off the pillowcase and attach to your skin. 4. Organic silk also has the same pH balance of your skin. Measuring pH really only makes sense when you’re talking about a water solution. Yes, skin has a optimal pH balance, but the pH of fabric you’re sleeping on is really irrelevant. 5. When sleeping on this pillowcase, your night cream is fully absorbed by the skin and won’t rub off like it usually does, therefore allowing the cream to work to maximum effect. I’m curious if Silkskin has any actual data to back up this claim. I suppose it’s possible that silk is less absorbent than cotton, which means it could absorb less oils and moisture from the surface of your skin. But even if silk is less absorbent, just the friction of your skin against the fabric as you move around in your sleep is still enough to wipe some of the lotion off your face. Without some kind of test data to show Silkskin has a beneficial effect, I’m skeptical on this claim. 6. Silk stops you getting the dreaded ‘bedhead’ as your hair will simply glide over the pillowcase. Bed head isn’t just caused by rubbing your hair across the fabric of the pillow. It’s also caused by the warmth and moisture of your perspiring scalp saturating your hair and reforming the hydrogen bonds (also known as salt bonds) in your hair, which results in the bizarre hair configuration you wake up with. Since silk doesn’t stop you from perspiring, it probably has little effect on bed head. But once again, if there’s test data to the contrary I’ll gladly reconsider my position. 7. Dust mites cannot live on silk so the pillowcase is excellent for allergy sufferers. This is the most intriguing of all Silkskin’s claims. While I found references to very tightly woven pillowcases being used to prevent dust mites from penetrating into pillows, I could not find any legitimate scientific source that answered this question one way or the other. There may be some legitimate benefits to sleeping on silk, but Silkskin makes a number of definitive claims without providing much information to back them up. Maybe it’s true that dust mites can’t live on silk, but I’d rather not take the word of the company trying to sell me the product as proof. A little independent confirmation would go a long way toward making me feel better about buying this product. Bottom Line: I have to say that I still debating this topic for myself. Though I think The Beauty Brains, as usual, make a strong argument against back sleeping and special pillowcases and pillows I still wonder if making some small changes could result in fewer wrinkles down the line. The number of times I have written a post in this blog about sun safety, skin cancer, or sunscreen could, at this point, fill a book. Well maybe not a book but at least a thick pamphlet. But since it is once again Skin Cancer Awareness Month I thought it important to revisit these topics yet again. It is always good to be reminded about proper sun safety. Skin cancer is an almost entirely preventable cancer so keeping yourself and your loved ones safe from the sun is of utmost importance. Yes, proper sun protection takes some extra time and thought, but preventing skin cancer shouldn’t be an afterthought. And I haven’t even mentioned the wrinkles and pigmentation issues that come from daily sun exposure. So if skin cancer doesn’t concern you particularly at least protect your skin from the sun in order to keep it looking young and fresh. • If you’re the outdoorsy type, you may want to take a summer vacation from retinols: They thin the top layer of skin and can make you vulnerable to redness and brown spots, says dermatologist Fredric Brandt. • One bottle of sunscreen is not going to last. “One ounce is the right goal for each application, as well as for each reapplication, so a 12-ounce bottle is 12 servings—and that’s not a lot,” says Patricia Wexler, an associate clinical professor of dermatology at Mount Sinai Medical Center in New York City. Set an alarm on your phone to ring every two hours to remind you to reapply. • If you’re outside for 30 minutes or more, wear a chemical sunscreen (like one with Mexoryl SX or Parsol) topped by a physical one (with Z-Cote or titanium dioxide). “Neither type is 100 percent perfect, and whatever rays get through the first layer are caught by the second one,” says Miami dermatologist Leslie Baumann. So whatever your daily beauty routine is make sure that it includes an SPF of at 15 but SPF 30 is better. Apply 365 days a year, rain or shine. And be sure that everyone you love and care about is protected from the sun as well. As I mentioned at the beginning of this post I’ve written so much about the topic of this post that I decided to choose some of my related posts to share here. If you type “sun” into the search line on the home page of this blog you’ll find even more related posts. UPF Clothing – Really Protecting You From The Sun? Should You Avoid Spray on Sunscreen? Does Brush On Sunscreen Give You Any Sun Protection? This post was inspired by two separate posts I read online. The first was Beauty Regrets I Wish I Knew In My 20s from My Beauty Bunny and the other was ATB Learning Curve: 10 Beauty Lessons I Learnt in My 20s from Addicted to Blush. (Full disclosure – I found the second post since my blog is mentioned in the post. Before then I did not know of this blog, but I am finding it quite fun to read a beauty blog from India) Though I am well past my 20s, and nearing 40 more and more with each passing day, I did find parallels in my beauty regime to what the ladies mentioned in their posts. 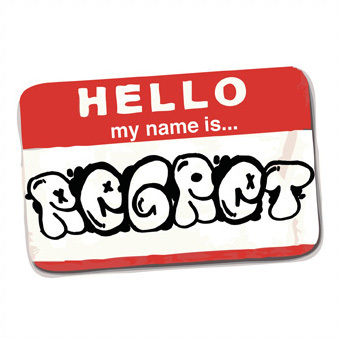 Overall I try not to have regrets when it comes to anything or everything in my life. But try as I might, of course, I do still have regrets. Mine mostly revolve around something I should have said to someone or something I shouldn’t have said to someone. I’m a work in progress but aren’t we all? Not taking sun protection more seriously sooner. I started using a moisturizer with SPF in it back in high school (or at least I think I did, maybe it was college), but now I know I didn’t use enough and I never reapplied. I have the sun damage to prove it. In the last few years I’ve become a sunscreen fanatic, and I am never without a sunscreen at all times so that I can reapply. Many people think I am insane because of my sunscreen fanaticism, but I don’t care :). I wish I had learned about skincare ingredients sooner. Until I started studying esthetics about five years ago I got all my beauty information from glossy fashion magazines. Not that those magazines cannot provide helpful information for the consumer, but they are certainly just one perspective on a complicated and far-reaching subject. Once I started my esthetic training I discovered a wealth of publications for estheticians that I currently read and blogs that help me sort through all the beauty mumble jumble out there (for a list look at the right hand side of my home page under “links I love”). I also started reading lots of books by dermatologists which I have found very informative (look under “book reviews” for my reviews). Better informed you are the better choices you make when it comes to taking care of your skin. Lastly, always remember to keep an open mind. I am constantly learning new things from my fellow estheticians, the reading I do, and from taking care of different client’s skin. So what are your beauty regrets? Share below!